Students experiment with gear motion to understand how gears work to change the amount of force, speed, or direction of motion in machines. For younger students, explain that in the challenges, gears are spools and the belts are rubber bands. Magnetic gear sets that will stick to a white board or chalkboard, or simple plastic gear sets can be used for gear demonstrations in place of the basketball and tennis balls if available. Other materials can be used if the recommended items cannot be procured. Any kind of spools, pipe cleaners, pegs, or any other items available will work. This allows the students to be creative in how they accomplish the tasks. The pegboard activity may be done as a demonstration if not enough materials are available for small groups. Other balls can be substituted for the tennis balls or basketball, provided there is a large size difference between the two types of balls. 1. Use a bicycle to explain gear basics. Display the provided photo of a gear, or hold up a gear for the class to see. Ask: Can anyone tell me what this is and what purpose it serves? Explain that it is a gear, and gears are used to increase or decrease force, increase or decrease speed, or to transfer or change the direction of motion. Ask: Can anyone tell me what the pedals are connected to on a typical bicycle? Explain that pedals are typically connected to the largest gear near the front. Show a picture of a bicycle. Ask: What connects this large gear to another gear on the bicycle? (A chain connects the gears.) Tell students that the gears, connected with a chain, transfer power from the pedal to the back wheel. So, when a person pedals a bike, the energy he or she is exerting turns into energy that moves the bike forward. Show the class a real bicycle, if possible, or the picture of a bicycle again. Invite students to point out the gears, chain, and pedals and to observe how they are all interconnected within the bicycle. Ask: Has anyone pedaled a bicycle up a hill? On a flat surface? Which is easier? Which is harder? Why? Get students to discuss their experiences riding bikes, and explain that the gears in the bike convert the energy they exert to energy that makes the bike move. 2. Participate in a group demonstration about gears using everyday objects. Ask: Why do gears have teeth? (Gears have teeth to prevent slipping.) Ask: If a gear had no teeth, what would it be? (In most cases, a gear without teeth would be a wheel. Relatively rare versions of gears without teeth exist, but nearly all gears have teeth.) Tell students this means we can experiment with gear behavior using other round or circular objects. Place two tennis balls side-by-side on a table at the front of the classroom. Call up a volunteer and instruct the student to place a hand on the ball to the right and a fingertip on top of the ball to the left. Have the student turn the ball on the right in a clockwise direction while gently holding the other ball in place with a fingertip. This should cause the ball on the left to spin in a counter-clockwise direction. Ask the student to describe which direction each ball is turning. Call up two additional volunteers. Place a third tennis ball into the straight line next to the first two tennis balls. Instruct one volunteer to place a fingertip on top of the middle ball to hold it in place while the other two volunteers turn the outside balls in a clockwise direction. Encourage the students to describe which direction each ball turns. Explain to the students that two interlocking gears will rotate in opposite directions. This reverses the direction of force within a system. By adding a third gear, the direction of force of the last gear in the chain is the same as the first gear in the chain. Ask for a new volunteer. Provide him or her with a basketball and a tennis ball. Instruct the volunteer to place the basketball to his or her right and the tennis ball to the left and bring the balls together so they touch. Now, have the student place a hand on each ball and turn the basketball in a clockwise direction four full turns while gently holding a fingertip on top of the tennis ball. Help count the turns of the basketball while the volunteer observes the motion of the tennis ball. Ask the student to describe what he or she observed. Ask the student repeat the demonstration, this time turning the tennis ball four complete turns and describing the motion of the basketball. Explain to the students that by using gears of different sizes, they can change the speed (velocity) of the system; this is called the gear ratio. For example, if you have two gears (A and B) and A is twice the size of B, then in one revolution of A, B will spin twice, thus increasing the speed (velocity). If you reverse the gears, the speed (velocity) will be decreased. So, the tennis ball spins at a different rate than the basketball. 3. Experiment with gears and belts using spools and a pegboard. Separate the class into working groups of 2-4 depending on the amount of supplies available. Distribute a pegboard, ten pegs, eight spools (four small and four large), four rubber bands, and a Gearing Up with Robots handout to each group. Give them the following instructions, or have students follow along as you demonstrate. Ask questions to check for student understanding and progress. Encourage students who are more visual to read the steps that are provided on the Gearing Up with Robots handout as they work. 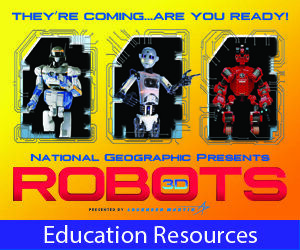 If students need help, display the Gearing Up with Robots photo gallery as they work. 4. Students use the pegboards and spools to solve challenges relating to gears. Tell students they will now work as a team to solve a series of challenges whose solutions involve gears. Tell them they must work as a team to solve each of these challenges, using their pegboards, spools, and rubber bands. Do as many challenges as time allows, or give each group a different challenge to work on. After each challenge, facilitate activity Step 5. Challenge 1: A robot needs power transferred to its wheels from a power source located a distance away; in addition, the direction of the motion needs to be reversed so the robot will go forward instead of backward. There are gears and a belt with which to work. What configuration will work to solve this problem? Challenge 2: A robot needs power transferred to its wheels from a power source located a distance away, but the direction of the motion does not need to change. There are gears and a belt with which to work. What configuration will work to solve this problem? Challenge 3: A robot needs to move quicker than its power source will allow and the engineer is willing to sacrifice power for speed. There is a large gear, a small gear, and a belt with which to work. In order to gain speed, which gear is placed near the power source? Challenge 4: A robot needs more power to navigate steep inclines and the engineer is willing to sacrifice speed. There is a large gear, a small gear, and a belt with which to work. In order to gain power, which gear is placed near the power source? 5. Have student groups share their challenge solutions. Ask groups to show their boards and explain their solutions. Be sure to prompt students to explain why they did what they did. Sample solutions to these challenges are provided in the Gear Challenge Solutions photo gallery. Allow for free experimentation if time permits. Sample photos of these solutions are included in the Gear Challenge Solutions photo gallery. Have students locate gears around the classroom. An example would be the gears in the classroom clock. Engineering Design: MS-ETS1-1. Define the criteria and constraints of a design problem with sufficient precision to ensure a successful solution, taking into account relevant scientific principles and potential impacts on people and the natural environment that may limit possible solutions. Engineering Design: 3-5-ETS1-1. Define a simple design problem reflecting a need or a want that includes specified criteria for success and constraints on materials, time, or cost. Set up the classroom so it is easy for everyone to see the demonstrations. Gears are used in machines to change the relationship between the driving mechanism of the machine (like a motor) and its moving parts (like a robot arm). They can be found in machines that we see and use every day, such as clocks, bicycles, and cars. A gear is a circular piece of hardware with grooves along its perimeter. These grooves form rises called teeth with spacing between each tooth. When the teeth of two or more gears fit together, they work together to affect the torque (rotational force) of the mechanical system by either increasing or decreasing the force or they will affect the direction of motion. Two interlocking gears rotate in opposite directions reversing the direction of force. The diameter of the gear plays an important function in the system; by using gears of different sizes, you can change the speed (velocity) of the system. The gear ratio is a comparison between the number of teeth in two gears that are working together. For example, if you have two gears (A and B), and A is twice the size of B, then in one revolution of A, B will spin twice, thus increasing the speed (velocity) of the smaller gear. To help students visualize this concept, show how the gears behind the face of a clock turn the hour hand and second hands. The gear ratio can also be determined by comparing the number of teeth on one gear to the number of teeth on the other gear. toothed wheel whose teeth mesh with teeth of another wheel to transmit or receive force and motion. ratio of the number of teeth on one gear to the number of teeth on the other gear. moment of a force or system of forces tending to cause rotation.